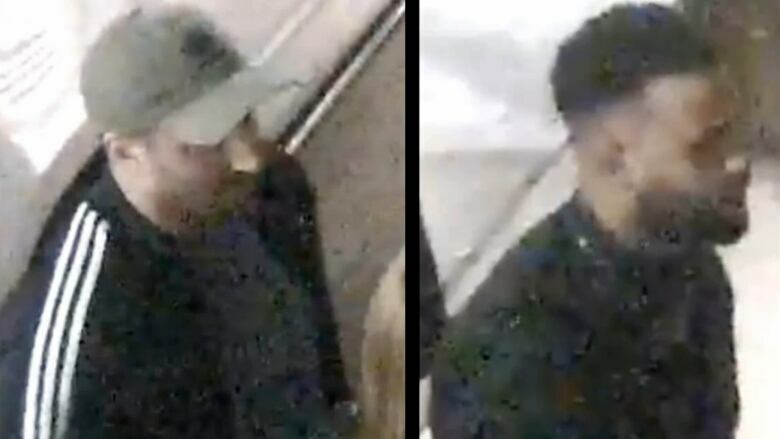 A year after it happened, the Vancouver Police Department (VPD) is asking the public for help identifying two men in connection with two assaults which took place during a fight in Yaletown on March 31, 2018. The VPD has released a video captured by Pierre's Champagne Lounge's security camera which it says shows the first assault during the fight. Police say staff at the lounge, located at the corner of Mainland Street and Nelson Street, called 911 to report a fight at roughly 2 a.m. PT on a Saturday. When officers arrived, they found two alleged victims of the assaults. The men had fled the scene. One victim, a 28-year-old Burnaby man, was taken to hospital with serious head injuries. The other victim had minor injuries. The video shows a man — wearing an Adidas cap and striped track suit jacket — punching the 28-year-old Burnaby man in the head, outside the lounge's front door. VPD say the punch took the victim off guard and he fell to the street, possibly hitting his head against the sidewalk. On the video, the cap-wearing man quickly walks away from the victim, who, VPD say, was unconscious at this point in the altercation. The second suspect is shown standing over the victim. He appears to lean over the unconscious man, gesture at him and take his picture. "At one point, he appears to take a photograph with his phone," said VPD spokesperson Sgt. Jason Robillard. "When someone is hurt, you might want to assist. But he didn't." During the same incident, following what police say was a sucker punch, the second suspect allegedly assaulted a second victim, an associate of the Burnaby man. Robillard said police are releasing the video now, a year after the "cowardly" assault, with the hope that the public will be able to help identify the two suspects. "This is a serious, disturbing assault. The victim continues to deal with the effects of his life-changing injuries," said Robillard. "Detectives have been working behind the scenes to identify the suspects, but we now need the public's help. We want to talk to all of the people involved and get their version of what took place that night." Anyone with information is asked to call the Vancouver Police Department or Crime Stoppers anonymously at 1-800-222-8477.